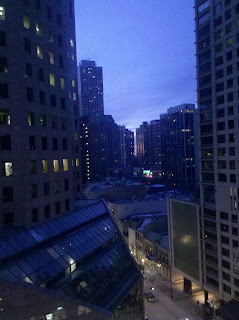 We just got back from the windy city of Chicago! The one day it was -10 to -20 wind chill! That was not enough to keep us from going shopping on Michigan Avenue! 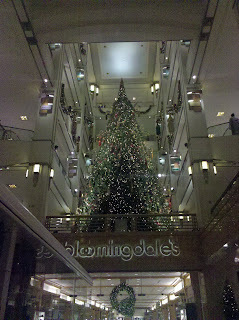 My DIL and I had a great time shopping at many of the stores on Michigan Avenue. (Maybe I should say window shopping.) For those of you that may not be acquainted with that area of Chicago, I will tell you that they have many, many, many stores within a mile! Stores like Saks Fifth Avenue, Cartier, Nordstrom, just to name a few. It was great fun just looking around. The shops were really decorated for Christmas, which I enjoy so much! 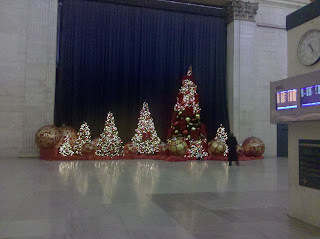 I love to take pictures of Christmas decorations. They are just so festive and happy! 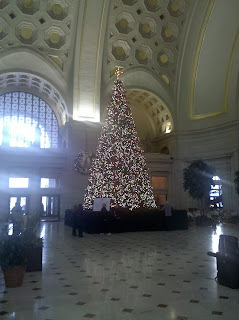 We went by train and had a stop at Union Station in Washington DC. This is their Christmas Tree! Absolutely beautiful! 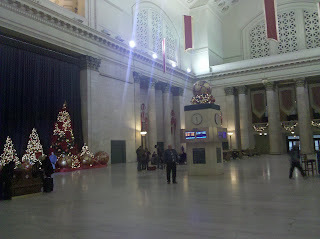 These pics were from the train station in Chicago! The view from our hotel room at sunset. Just one of the beautiful shop decorations that I saw. We did get to two quilt shops. 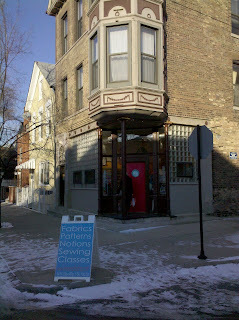 The one was Quiltology, which I blogged about earlier and also a shop called The Needleshop. 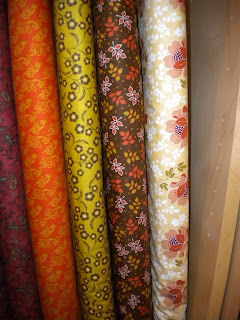 It was a very nice shop with prints from Amy Butler designs and similar fabrics. 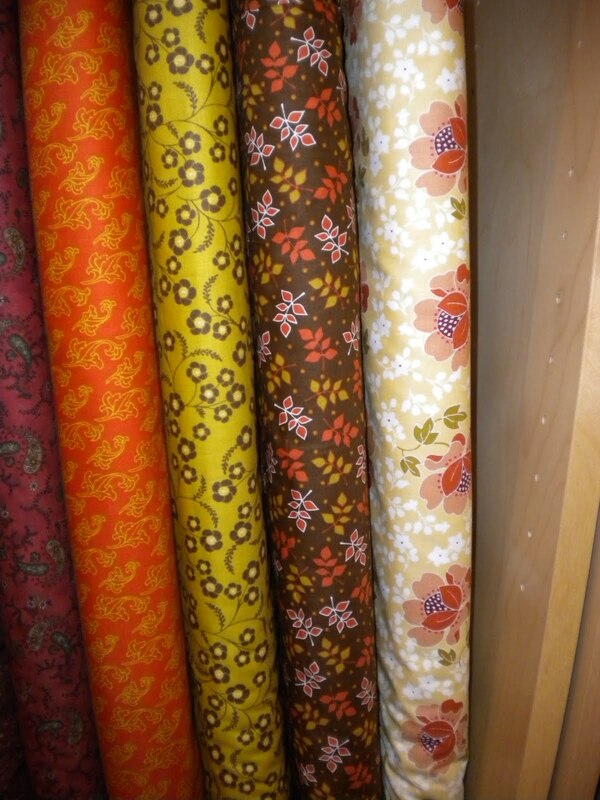 They also carried some fashion fabrics. They run many classes on dress making and bags. I didn't just window shop at these stores. :-) It's always great to add to the stash! In early December we had a beautiful snow fall. The snow just coated everything and made everything just glisten. My hubby and I walked a trail and got a chance to enjoy all the beauty around us. After our walk, we decided to head to LebanonPA for a quilt show. The Lebanon Quilters Guild had their show at the Fairgrounds and Expo Center. It was a very nice show with many beautiful quilts. They are very talented ladies. Not only was there a quilt show, but also a display of wonderful gingerbread houses and beautifully decorated trees! It was a very enjoyable day, indeed! Here is a small sampling of some of things we saw. I'm not sure what the club will be next year, but I will keep you posted. Meanwhile we will meet same time, the 2nd Wed. of the month. Thank you for your support through the year! You guys are great! Notice the beautiful scarves knitted by Mary Alice for both her and her sister Eleanor. They are beautiful! It looks like someone told a funny story! 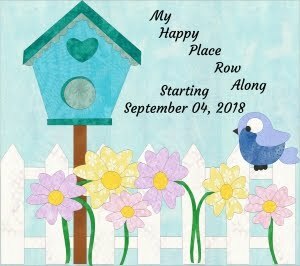 I have been following Bonnie Hunter's website and blog for a while. I am hooked on her patterns. She is so talented and makes the best scrappy quilts! I just finished her Orange Crush pattern and thought that I would share a picture of it. The quilt pattern made a much larger quilt, but I decided that I would do one for my kitchen table for fall. I had figured out how many blocks to do and then the border, so that it would just hang over the edge of the table a few inches. I finished piecing the blocks and sewing them together and then decided on my best approach for the borders. As I looked at it, I thought why not make the border strips the same size as the cornerstones that I made for the corners of the borders. However, I forgot about adding extra for hanging over the sides of the table. Yes, you guessed it. I sewed it, then quilted everything and not until I tried it on my table, did it dawn on me what I had done. 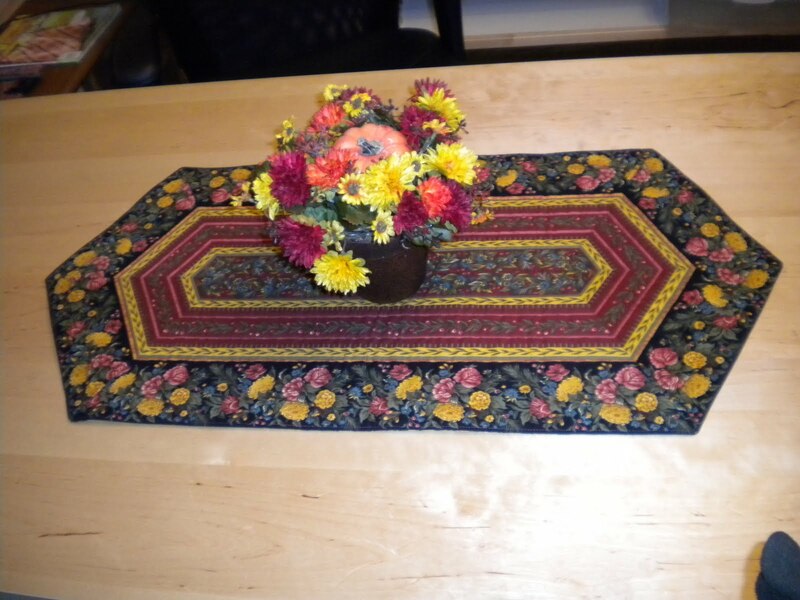 Well, all I can say is that I either have a wonderful extra large table runner :-) or I can use it as a wall hanging or throw for the fall season. It's still beautiful to me and I love it! 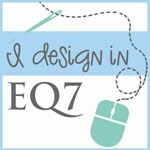 Bonnie offers many wonderful free patterns on her website. Be sure to check them out! Thanks Bonnie! Here is a close up of a quilting pattern that I used from my favorite embroidery site. Here is my quilt on the table, but no hangover! 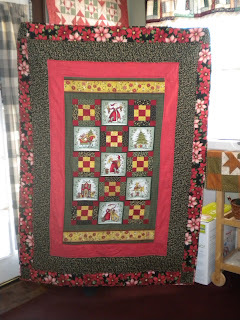 Stacey has sewn a number of Christmas Quilts this year. She just finished a lap size one for her Aunt. It looks wonderful! Good job Stacey! I just celebrated my Birthday last week. It was a great day! I received many well wishes, gifts and cards. Thank you! 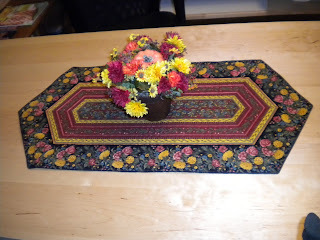 I wanted to share a picture of a table runner that my DIL Zlaty made for me. I absolutely love it and will cherish it. To see more of Zlaty's beautiful creations, check out her blog here. Thought I would share a pic of new fabric from Henry Glass & Co. called South Hampton. I love the rich fall colors and in particular the large floral print! Our shop hop is over! We had a great time! Thanks to everyone who stopped by! Thanks to those who shared some Show & Tell too! You can buy some of Janie's things here. It's shop hop time! I just finished binding my shop hop quilt. The theme is Stone Cottage Baskets featuring the Stone Cottage fabrc line by Renee Nanneman for Andover Fabrics. It is a beautiful line featuring pinks, reds, browns, soft greens and cream. The blocks were designed by some of the ladies from our shop hop shops. Each shop sews the blocks and puts them into a quilt of their own design. It is like a quilt show, but you must travel to each shop to see their quilt. It is so much fun! The shop hop runs Sat., Oct. 31-Sun., Nov. 15. For more info, you can click here. Here is a picture of my quilt and I also made a tote bag with my extra block. I hope you like it. My daugher in law, Zlaty quilted the quilt for me and I think it looks beautiful! Thanks so much Zlaty. I love it! Zlaty has a great blog! Check it out here. This past weekend we went to the Berry Basket Quilt Show in Marlton NJ. It was a very nice show. So many great quilts. I took at least 50 pictures! I will share a few of my favorites with you. This one was at the entrance to the quilt show. It says "They touched the quilts at the quilt show." Too funny! Friendship and some Days to Remember by Mary Koval. Folk Art Favorites by The Buggy Barn. Batiks by Fabrics that Care. Hopefully in future posts, I will have samples to show you made in all these fabrics! It won't be right away since shop hop is beginning next Sat., Oct. 31. When I get my quilt back from being quilted, I will post it on the blog. I just love when my customers bring in their projects for show and tell. This beautiful lady was made by Anita. She did a great job with the applique. Brenda finished this bow tie quilt. She bought the blocks and put them together in this wonderful quilt. The bow ties are 3D. I love bow tie blocks! Winter Blessings was made by Bev. She used needle punch for the lettering. 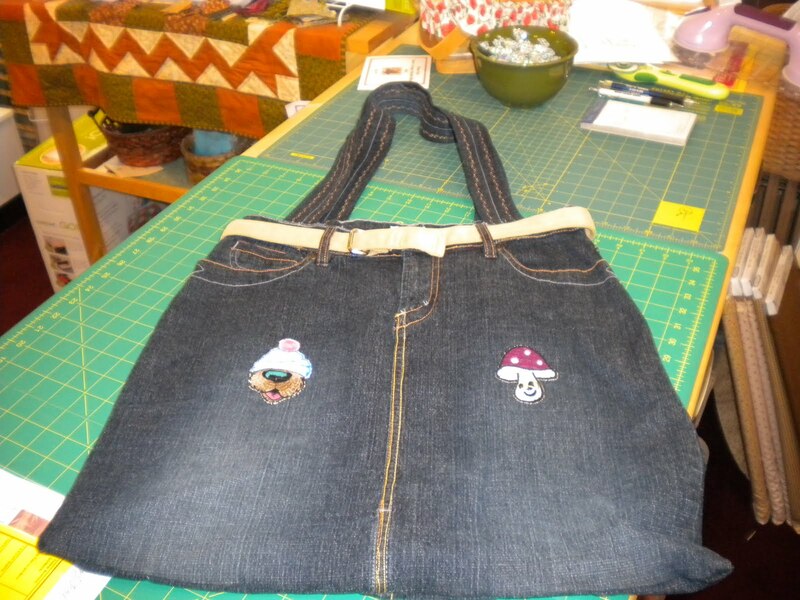 Sue made this great tote bag using part of the Pumpkins and Spice panel. The other week I got a chance to go on a quilt retreat with a couple of friends. We rented a house in Lititz, PA and had our own private retreat. It happened that on the weekend that we chose, there was a chocolate walk on Sat. We bought a pass with a button and starting visiting many of the shops located in town to sample their chocolate wares. There were 30 participating shops. We made it to 24 of them! The samples were delicious and it was a lot of fun. Some places even had samples for your dog. Lucky Jasmine! She not only got some treats from me, but my friends as well. After the walk, we went back to the house and started sewing! Chocolate Mice from the Chocolate Walk. All of these are made from chocolate. I got a chance to work on a surprise for my daughter. 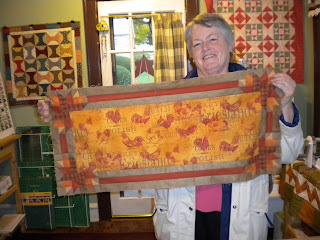 She loves Halloween and I saw a cute 12" wall hanging in the Fall issue of For the Love of Quilting by Fons and Porter. I started it when I was on the trip with my hubby to Illinois and just about finished it on retreat. I finished it when I returned home and thought I would share a picture of it. Janie stopped by and shared some more show & tell. She is one busy lady! I love all of her projects.